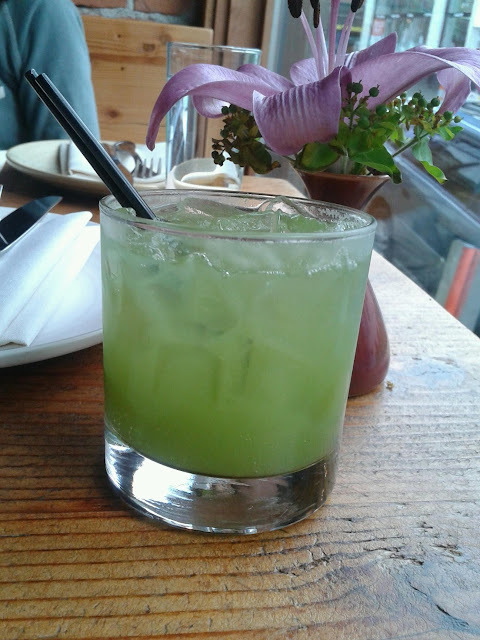 I started off with their fennel and grapefruit soda. It was citrus than anything and I found the fennel taste to be almost non-existing. However, it did remind me of a drink I've had in Malaysia which tastes very good so I wasn't totally disappointed. 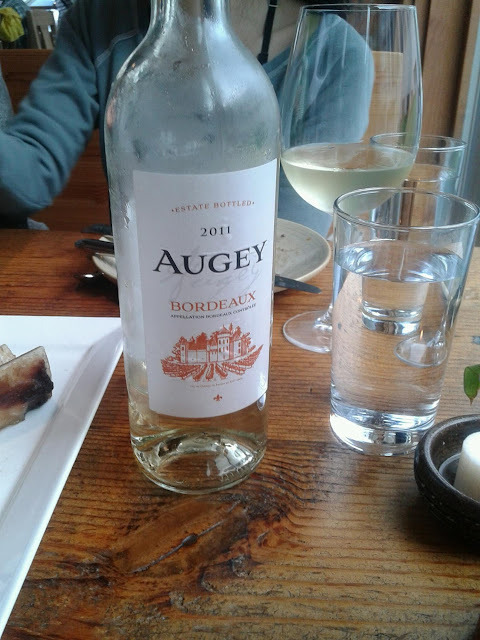 We also selected this wine to pair with our dishes which was majority seafood. 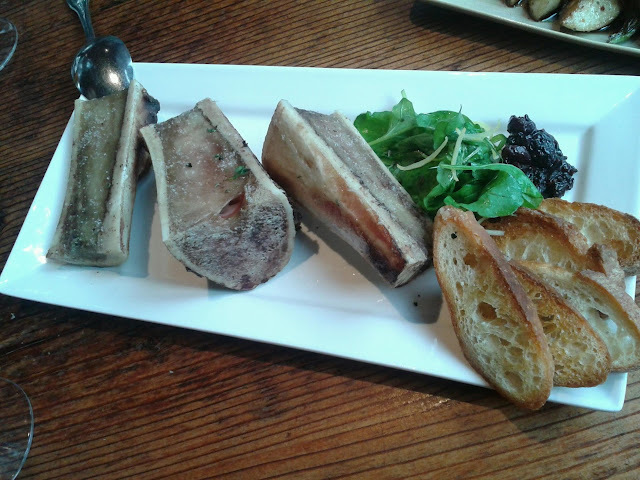 Our first appetizer dish were these large beef bone marrows. Prepared very simply with just a little salt and a date compote mixture, the juicy (almost fat like) bone marrow melted onto the crusty bread and paired very nicely with the date mixture. It is very rich and not recommended for those that do not like the texture of fatty foods. 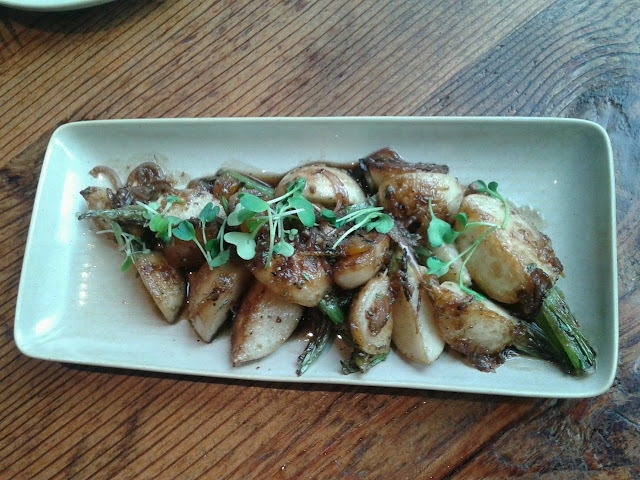 We also had this baby turnip dish, cooked with orange and some other garnishes. This was absolutely wonderful. The flavors complemented so well together and the texture of the turnips themselves were nice and tender--a wonderful start. Then came one of the earth dishes that would probably the mos 'not worth it' dish. 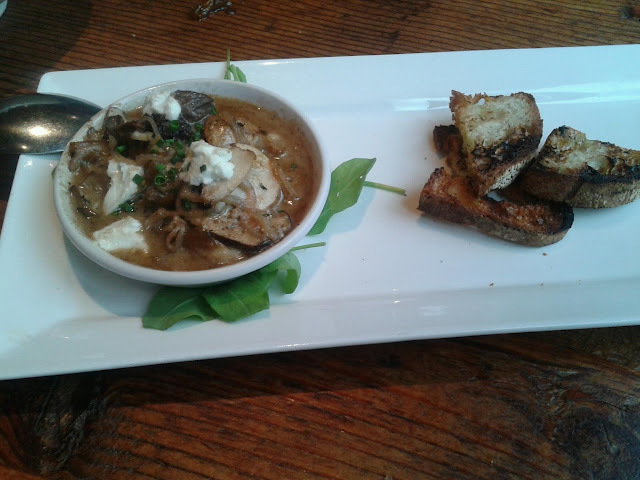 This small wild mushrooms gratin was a bit pricey, and didn't come with enough of the toasted bread. However, the mushroomws, especially the morel mushrooms, were very delicious. The creme fraiche melted nicely with the sauce that gave it a ricotta cheese feel and the sauce was butter heaven. I just wish there were more components to this dish, maybe even pair the sauce with rice, to make it more worth the price. 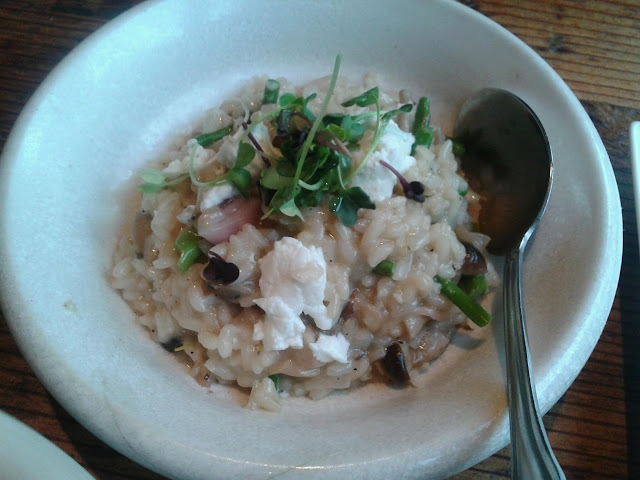 Next was the risotto. I loved the little baby asparagus in this, which added a nice texture throughout, however this was a very rich dish. I couldn't have too much since it was quite heavy, but the flavors were there. 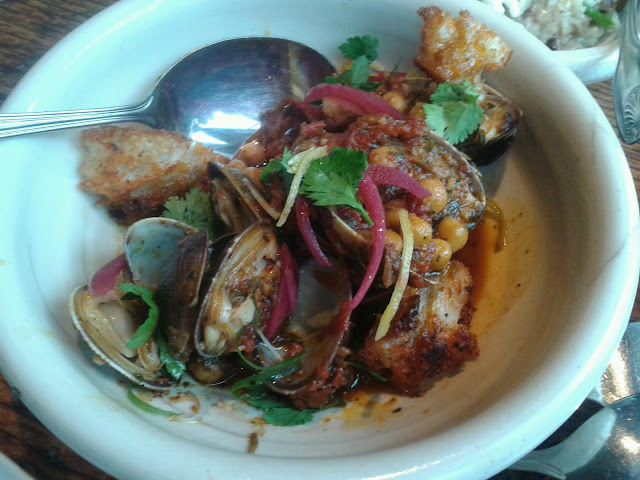 The Manila clams with their homemade chorizo sausage was probably my favorite dish. 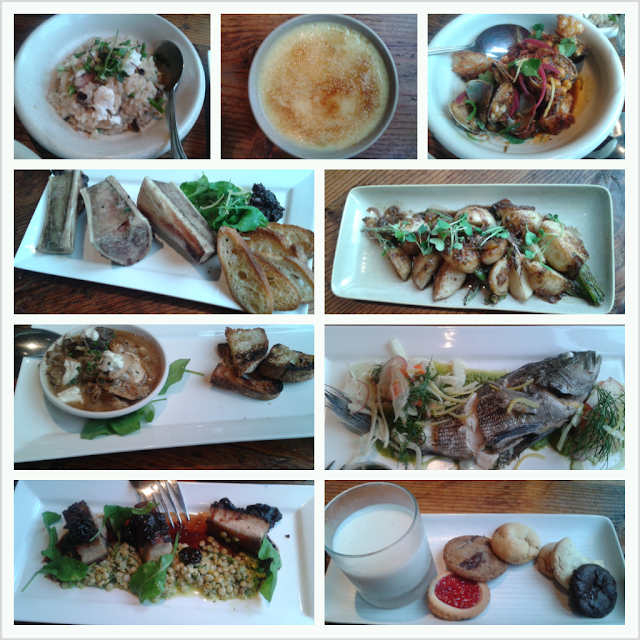 It was a total flavor impacted dish with just the right amound of textures and flavors mixe around. The smokiness of the sausage balanced out nicely with the chickpeas and pickled onions which all complimented the flavors of the clams. Not to mention the giant crouton pieces of bread throughout the dish to soak up all the juices! The next dish to come to us was their so called 'sea bass' dish. Now, this isn't the typical Chilean seabass, that a single steak would weigh more than this small fish, but a part of the bass family. I think they should've made that distinction, but honestly, I don't think they really knew. 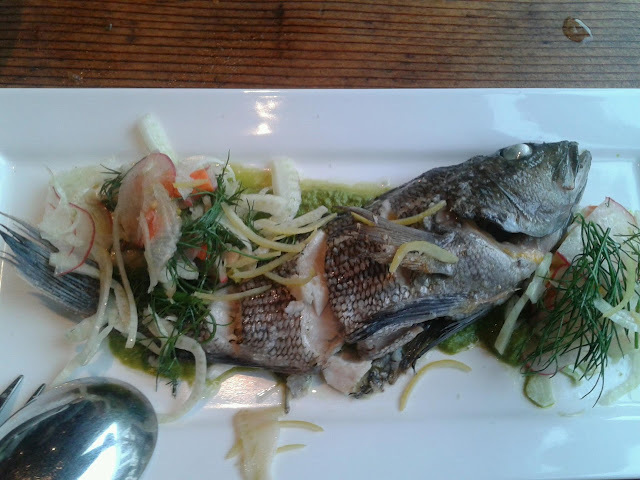 This was one of the first times I have seen a whole fish, head and all, steamed in it's entirety at an American restaurant. I see it all the time at Chinese ones but this is a first seeing it at an American one. The preparation of this fish was simple and did not leave a fish/seafoody smell, which is always difficult to accomplish. I'd only wish the fish was bigger for the price, but overall it was decent and very fresh. 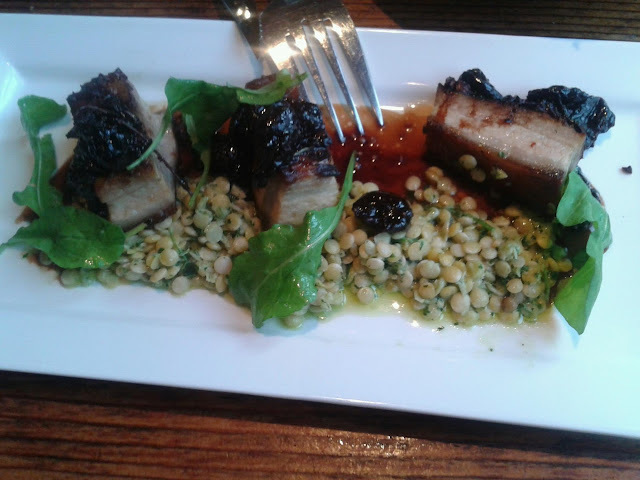 The last dish to come out was this pork belly and lentil dish. Very reminiscent of the way Chinese restaurants prepare it with a hint of five spice, this was a very comforting and delicious dish. Half a piece even satisfied me. The pork belly was very tender and melted right in your mouth. Then it also had a crunchy element of the skin. The lentils paired nicely with it along with the fruit compote along the top to glaze it. Then for essert we had the creme crulee and the cookies and milk. 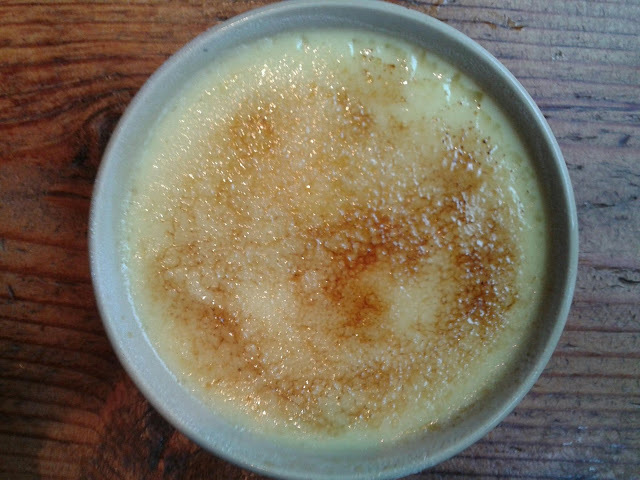 A light and creamy dish that wasn't too sweet and had a nice crunch on top with the fired sugar top. 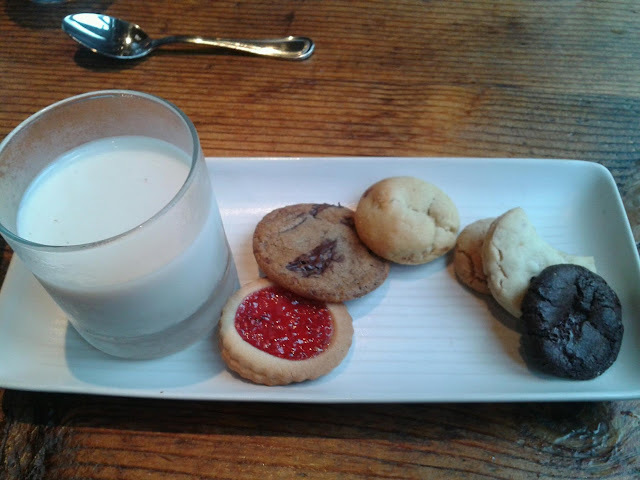 I mostly picked this cookies and milk out because of the horchata (mexican rice drink with cinnamon and sugar). 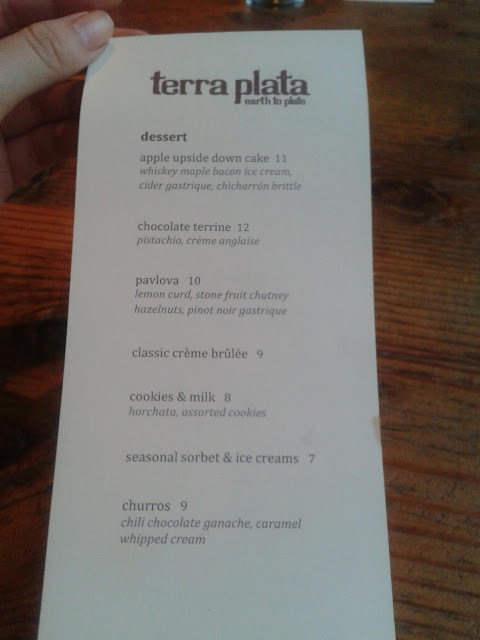 The cookies were so-so (probably not worth 8 dollar at all) but their horchata was very good. This restaurant was definitely a good experience, but the prices can add up. Our total bill was slightly over $200. We did however have wonderful service. Our server was very gentle and checked up on us frequently and thoroughly explained our dishes. He also changed our dishes to make sure we had clean ones and kept refilling us with their bread. If you're looking for a cute place to go with the family or a date, this is a good place to try out in Capital Hill.